The 12th IGF was the first IGF for Peta Bencana and specifically for myself. I found that the topics for the sessions at the IGF were very diverse. The pre-event (Day 0) was already packed with discussions. I went to a workshop session “Working Toward Universal Access: Educate, Engage and Empower” organised by The Institute of Electrical and Electronics Engineers (IEEE). At this session, Vint Cerf (co-creator of TCP-IP) pointed out that there are 3.9 billion people without Internet, and he asked participants to imagine if, by 2025, “Internet for all” was a reality. The discussion was engaging as the organiser break everyone into groups to discuss broad Internet access issues such as universal digital literacy, digital gender divide, community networks, etc. Afterwards, I jumped from session to session to observe the rest of the day zero event, which I also found engaging. The first official day of the IGF was packed with Seed Alliance sessions. Peta Bencana joined the awards ceremony for the ISIF Asia Internet for Development Award 2017 and shared the moment with three winners from the Fund for Internet Research and Development (FIRE) Africa and two winners from the Regional Fund for Digital Innovation in Latin America and the Caribbean (FRIDA). 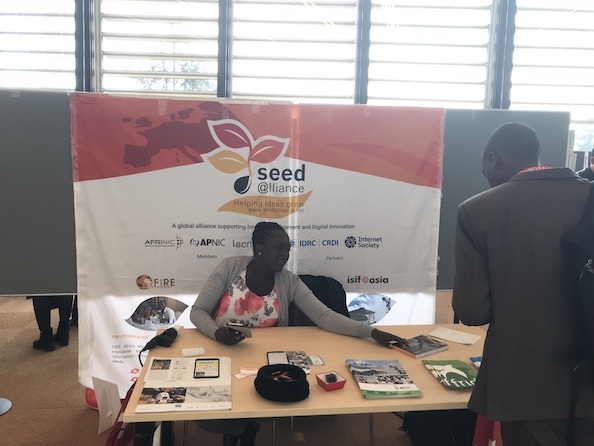 Later, all the Seed Alliance winners shared a booth at the IGF village, showcasing our projects, sharing how Internet-based solutions can contribute to social and economical development. At the second day of the IGF, I had the opportunity to share about Peta Bencana’s work as a speaker at the open forum session “Data for Humanitarian Field” organised by the International Federation of Red Cross and Red Crescent Societies (IFRC). The open forum discussed how local community works with new data (e.g. online information, geospatial data, crowdsource) for humanitarian purposes while tackling challenges such as digital divide, data literacy, and data privacy. At the forum, I shared some of our team experiences when developing PetaBencana.id platform such as how we are working with the range of different mobile applications and integrate the information into one place, how we are working with the range of different communities (government, non-government/civil, and academic institutions), including how we valued their inputs to improve the platform. Watch the full video of the Open Forum “Data for humanitarian field panelists”. Left-to-right: Emir Hartato (Peta Bencana Foundation), Rania Alerksoussi (IFRC), CJ Hendrix (OCHA), Moderator: Heather Leson (IFRC), Online Moderator: Barbara Rosen Jacobson (Diplo Foundation). 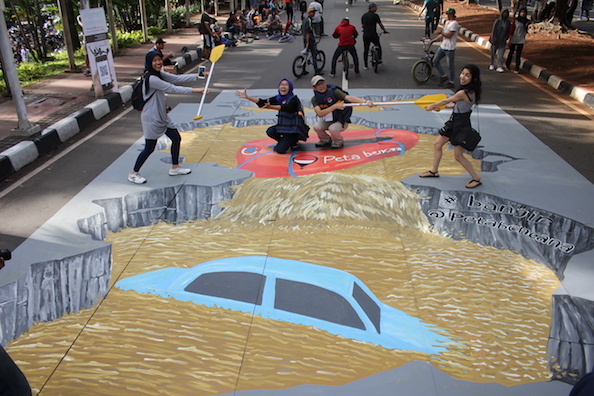 I also shared our recent community engagement activities, #SelfiesSaveLives, in which we installed paints street art for monsoon preparedness in Indonesia, funded by the ISIF Asia Award cash prize. 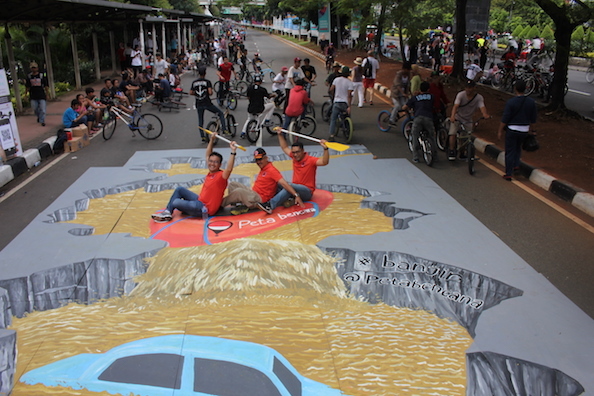 Residents in Jakarta were invited to engage and take selfies with a flood-themed anamorphic mural, then share it to their social media networks to spread the message to help each other in time of disaster and build a resilient community together. Hacking the street during #SelfiesSaveLifes in the Jakarta Car free Day on 10 December 2017. Peta Bencana will replicate this community engagement activity for other places. Photo: Peta Bencana documentation. For the rest of the IGF, I joined several sessions such as “Fake News, AI Trolls, and Disinformation” organised by National Democratic Institute, “Data on Environmental and Climate Activities” organised by the World Meteorological Organisation (WMO), “How Social Media Shape Our Minds?” organised by NetMission.Asia, “Data Protection and Humanitarian Action” organised by International Committee of the Red Cross (ICRC), and “Data and the SDGs” organised by SDG Lab at the UNOG. I believe that other sessions were also interesting, however, due to the time constraint I only had the opportunity to attend some of them. Outside the IGF schedule, there was always something to do. 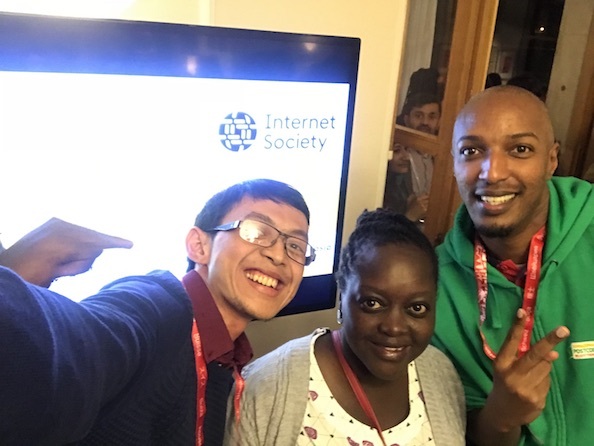 Most organisations had social events in the evening such as Disco-Tech, Access Now’s pizza night, ISOC-ICANN reception, APC party, including Seed Alliance Social. I found these social events are the best way to interact and meet new people to expand our network. Seed Alliance Social. Photo: Seed Alliance, Emir Hartato (Right). 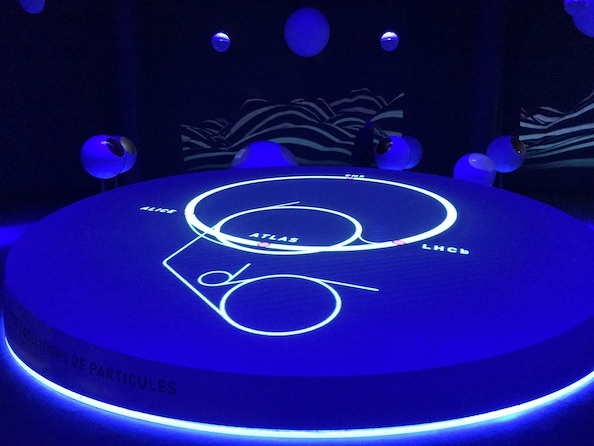 I also managed to visit The European Organization for Nuclear Research (CERN) on the last day of the conference. 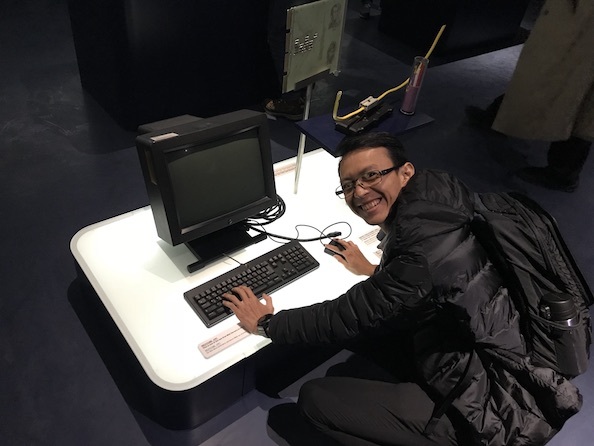 I joined the scheduled tour with other IGF participants and I had a great experience visiting the Globe of Science and Innovation, including a visit to CERN’s data centre, where I learned a lot about the birth of World Wide Web (WWW). The Internet gains a lot of attention from a diverse group of people. The IGF brings people all around the world to share and learn how Internet opportunities can be maximised while addressing the risks and challenges. The digital divide is a major issue at the 12th IGF where 3.9 billion people live currently lives without the Internet. Meanwhile, the rest of the population who have Internet access facing issues such as disinformation, internet censorship, internet shutdown, cybersecurity threats, digital gender divide, net neutrality, and many more. By looking at the schedule, big data and Artificial Intelligence (AI) are one of the appealing topics at the 12th IGF. About 2.5 quintillion bytes of data created every day from various sources (e.g. sensors, social media, digital photos and videos, mobile phones). These data can be generated to useful information. However, concerns rising over data privacy and security. People are using the Internet in many ways positively. PetaBencana.id is one of a good example to showcase the Internet’s capability to support development. Therefore, It is important to keep the Internet free and open to everyone. 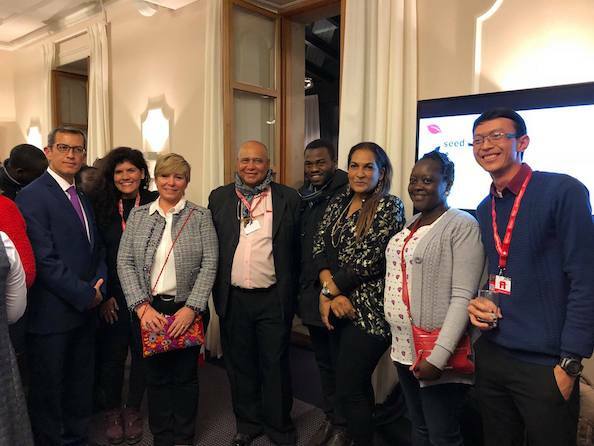 Moreover, being able to connect with a diverse range of people around the world is an invaluable privilege at the IGF. On behalf of Peta Bencana team, I would like to thank ISIF Asia for supporting Peta Bencana through the “Internet for Development” award. This award is not only a recognition but also a motivation for all of us to continue our work on using the Internet for good through PetaBencana.id platform. We also would like to thanks to all our partners MIT Urban Risk Lab, USAID, Badan Nasional Penanggulangan Bencana (BNPB) Indonesia, the Humanitarian OpenStreetMap Team (HOT), Pacific Disaster Center (PDC), residents and local agencies in Indonesia who have worked with us to create more resilient Indonesia. 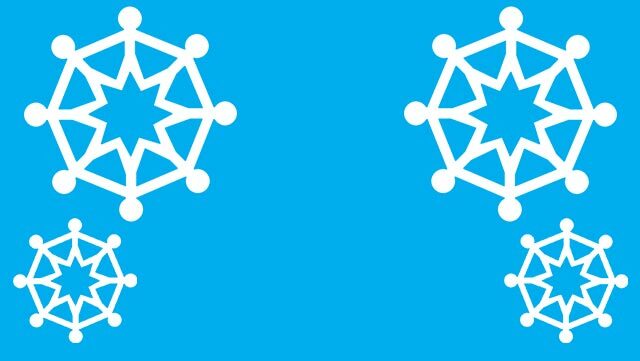 The Internet Governance Forum (IGF) is a forum for multi-stakeholder dialogue on public policy issues related to key elements of Internet governance issues such as the Internet’s sustainability, robustness, security, stability and development. 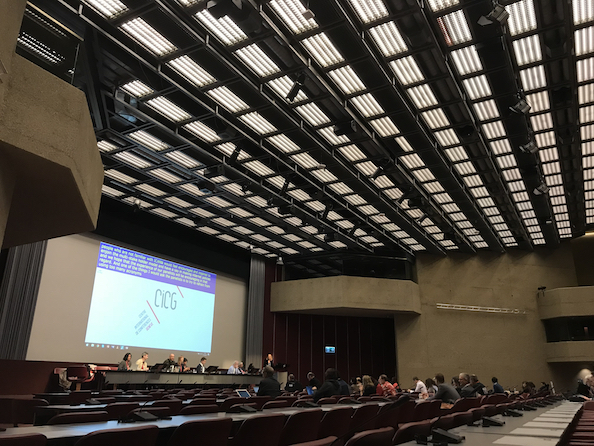 The 12th IGF, with the theme “Shape Your Digital Future”, was held at the United Nations Office Geneva (UNOG) Switzerland from 18 – 21 December 2017. With the generous support from the Information Society Innovation Funds (ISIF) Asia through the Internet for Development Award 2017, Peta Bencana Foundation was able to participate at the 12th IGF to promote the value of Internet technology to support disaster management, specifically PetaBencana.id platform, a free web-based disaster map that produces megacity-scale visualizations of disasters using both crowd-sourced reporting and government agency validations in real time. This post highlighted Peta Bencana activities at the 12th IGF, which represented by Emir Hartato (Project Co-Manager).